MACIAS PR was founded in 2009 by a former Executive Producer with NBC and Senior Producer with CBS. Journalists and industry peers consistently rank MACIAS PR as one of the best PR Firms based on our results. Over the years, MACIAS PR has launched publicity, media and branding campaigns for companies from all industries. We’ve worked with boot-strapped startups, securing publicity that led to increased funding. (We have the case studies to prove it). Our firm has also run branding and media campaigns for established companies and brands that needed to stand out from the clutter. 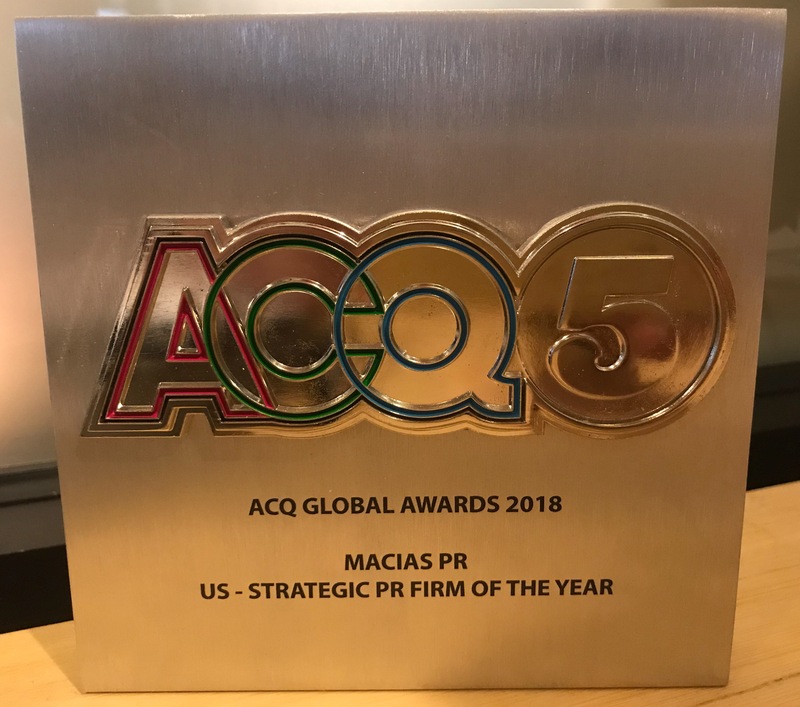 In 2017 and 2018, digital marketing peers named MACIAS PR the Strategic PR Firm of the Year. As part of the selection process, marketing and PR professionals reviewed the media campaigns promoted by our firm. More than 80,000 digital marketing, PR firms and publicists were nominated from across the country but MACIAS PR was the only firm selected in the USA. Finance Monthly also named us the 2015, 2016 and 2017 PR Firm of the Year – USA. Journalists with the publication reviewed our media deliverables, expertise and innovation in PR as a prerequisite for the award. You can read more on those honors and awards by clicking here. MACIAS PR has run B2B and B2C media and branding campaigns for clients in healthcare, health tech, tech startups, financial services, asset management, nonprofits and service sector industries. Message Mark at the bottom of this screen (green button on the right) if you would like to hear a customized media strategy. We can also give you a PR estimate by clicking here. The owner of an affiliate service emailed me recently, asking about a PR starter kit for her clients. Her intentions were in the right place with her email. 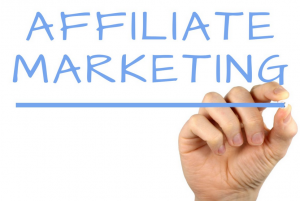 “I’m looking for a very inexpensive package to offer my (affiliates), a sort of starter kit to help kick-start their marketing campaign. Most of them have no clue what to do,” she wrote. Hiring a publicist is not like buying a shirt. There is no universal “starter kit” that works for every business. For each campaign to be successful, you need to identify the story and what makes it unique. If you are selling t-shirts to teenagers, that requires a different publicity strategy than selling suits to men. And to underscore that statement, it’s even more strategic when targeting women. PR is in many ways like a puzzle. The best PR firms will connect the dots and identify the right narrative for your business. An experienced media strategist will also find ways to fit your narrative into the larger, media puzzle. MACIAS PR has a consistent track record for securing stories with the biggest names in news. From the NBC Today Show to Good Morning America, our firm has gotten on our clients on these morning shows. We find unique ways to connect your story line into the news line. It’s not an easy task, especially in today’s cluttered market where startups of all sizes are striving to stand out in the market. The most creative people are typically seen as eccentric or even chaotic with their approach to life. It’s great to approach life with that creative flair, but when it comes to successful PR campaigns, clarity is equally important. The foundation for all creative work revolves around clarity. 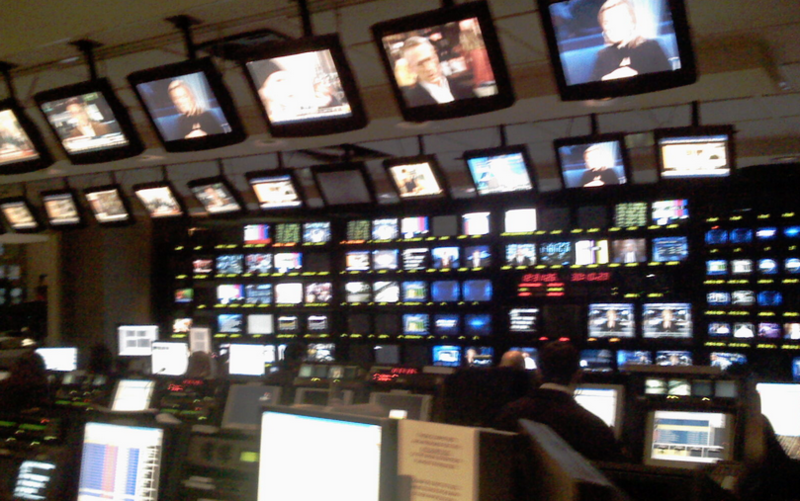 I’ve seen it in the media as an Executive Producer with NBC. I’ve observed it with actors as a playwright producing an Off-Broadway play. I’ve also seen at work how clarity is crucial for every PR campaign. During my time in the media, I used to get all kinds of pitches from publicists. Most of the time, I never knew what story they were pitching. Their stories didn’t have focus or vision. The message wasn’t tight. I didn’t understand what the publicist was pitching. 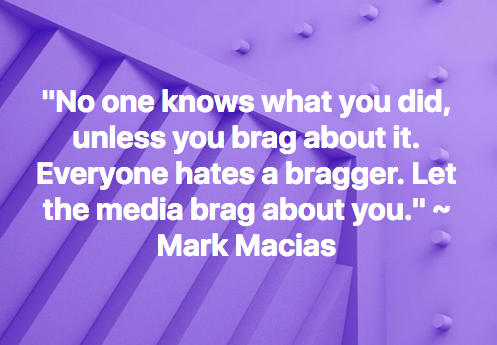 This approach to PR is one of the advantages that MACIAS PR has over our peers. We will will never push a story angle that isn’t clear. We will also make sure that our angle is understand – from an editorial perspective. 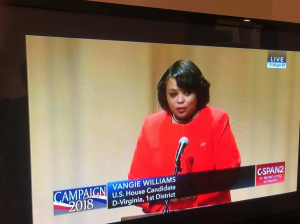 If you’re having trouble getting traction with the media, email us and we’ll schedule a strategy session that will bring clarity to your media message. 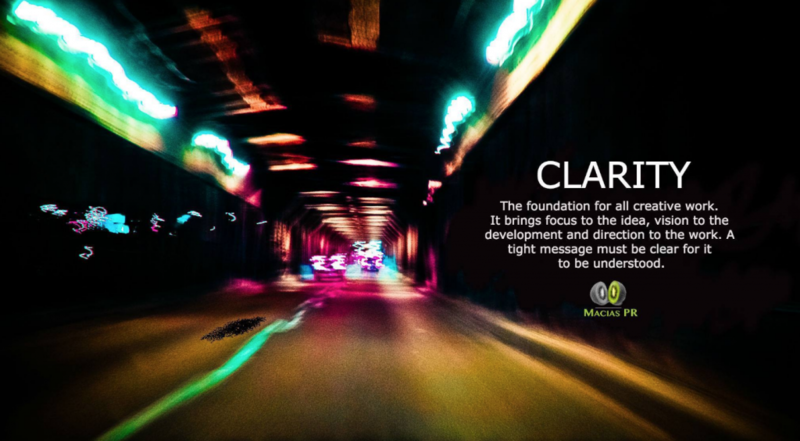 The depth and expertise of MACIAS PR goes deeper than most other PR firms. If you look at our roster depth – and the types of media campaigns we run – you will see a diverse portfolio of clients. And not just in simplistic B2C industries, but also complicated B2B industries. MACIAS PR has led media campaigns for Congressional candidates, dating apps, consumer products and apps, weight loss programs, compliance and law firms. We’ve also run B2B media campaigns for pharma, healthcare and healthtech platforms. Despite the diversity of those clients, one thing remains consistent. 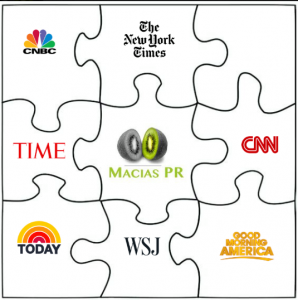 MACIAS PR continually delivers tier one placements with the biggest name in news. So how do we do it? PR is more than just telling your story through the media. An alternative and equally influential media campaign will use customers to tell your story. This form of PR, positioning your customers as characters, is very effective when it comes to hyping the quality of your services. Of course, it must be true. Reporters can read through hype when it’s not backed by substance. So how can you do this with your brand? The two photos might look similar at quick glance. 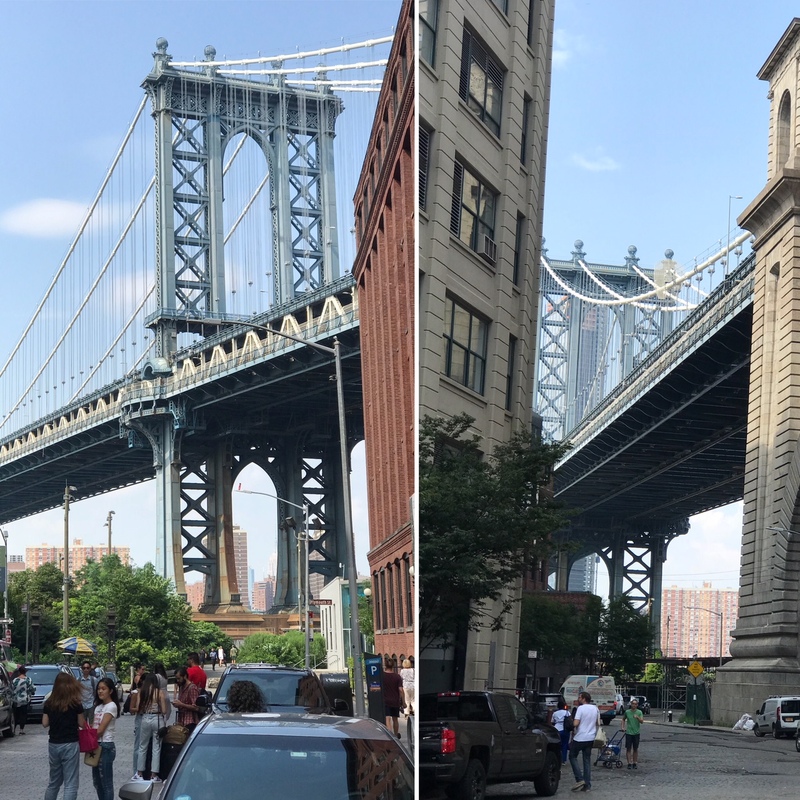 It’s the Brooklyn Bridge with people on the street. It’s shot on the same day. When it comes to the media, the position of the angle makes the difference between success and failure. The best PR firms understand the nuances and viewpoint that can change with subtlety. MACIAS PR continually digs for the unique angle that best positions the client in the news. We don’t just run with our first big idea, nor do we “spray and pray” for media placements. Each media campaign and story pitch is methodical and debated. What Media Deliverables can you Expect? I conversed recently with a health tech startup out of Eastern Europe, looking for PR. Following our conversation, the company asked a straight-forward question via email: What kind of media deliverables can we expect? Many PR firms promise the world during the sell, but fail to deliver once the contract is signed. I know this because I continually hear from potential clients on how they got burned by their last PR firm. So how can you protect your business and brand to ensure you get the most exposure and best coverage?